I’ve been blogged! Remember I was lamenting to you just the other day about how far behind I was in my blogging of recent events, and how my life was racing past, yada yada yada…Well here’s one blog I won’t have to write. Melbourne-based Cindy and Michael are committed vegetarians who blog their non-carnivorous life with precision, enthusiasm and good humour. 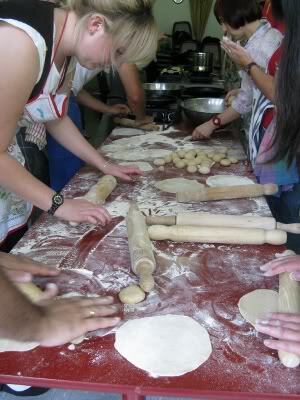 They recently attended a cookery class of mine in Melbourne, and reported their experience a few days ago. 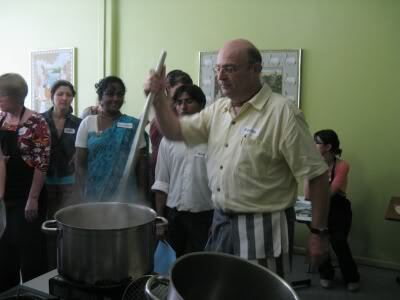 Kurma’s life as a chef is tied very closely to his involvement in the Hare Krishna movement and thus this class was held at Gopal’s restaurant, where Kurma was head chef for many years. 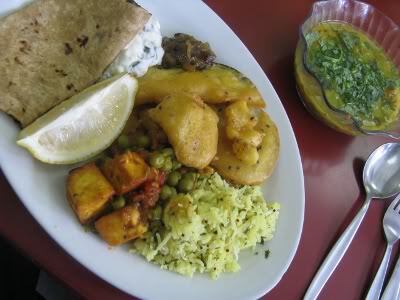 The foods we prepared, following the theme “Classics from the Subcontinent”, were very much like the dishes I’ve enjoyed eating at various Krishna restaurants over the years. 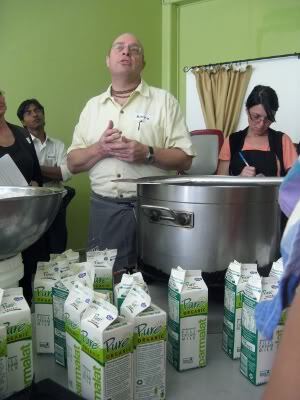 As you can see above, our class began with litres and litres of milk. 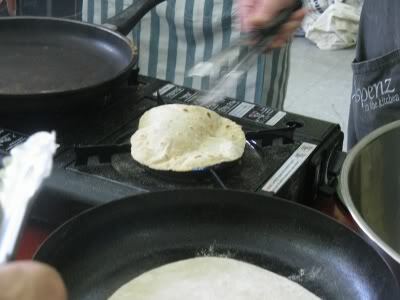 We’d be making panir! This fresh cheese combines a lot of milk with a small amount of acid to create the curds. 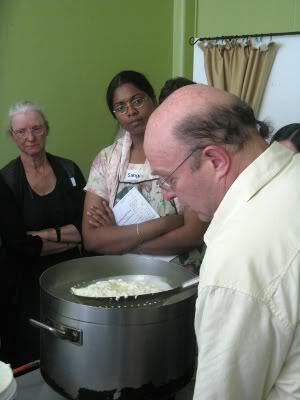 From there it’s all about draining the whey from the curds, compressing the curd for at least an hour so that it forms a firm ball of cheese. Though most of the panir was destined for a curry, Kurma chopped up a little of it for us to taste as soon as it was ready. Drizzled with olive oil and lemon juice, seasoned with salt and pepper then sprinkled with fresh parsley, the still-warm cheese was incredible. I would make it again at home, just for that kind of snacking. This is the hot and sweet apple chutney. For the ‘hot’ part, Kurma brought in some of his home grown habaneros (which I’d previously read about on his blog). He said that these were the second hottest variety in the world and that chutney should be “too hot to bear, yet too sweet to resist”! This chutney solidly hit both marks – it was terrific spread so, so sparingly on the pakoras. 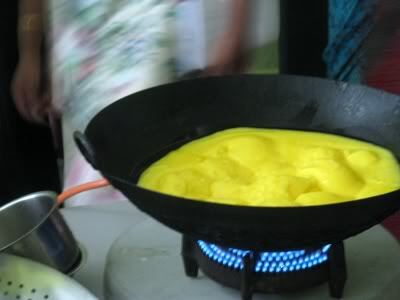 You’ll see the pakoras later in the post but here’s the massive quantity of ghee that we cooked them in, which we started heating up around this time. 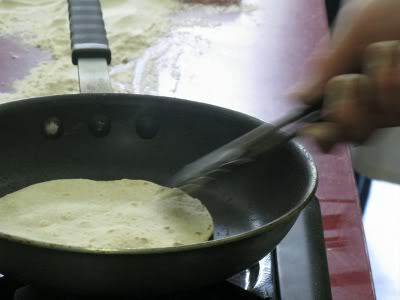 Next Kurma showed us how to make chapatis. These unleavened breads need no more than flour and water. OK, and maybe also deft hands. … then directly on the flame where, if you’re lucky, they’ll puff up like starchy balloons. 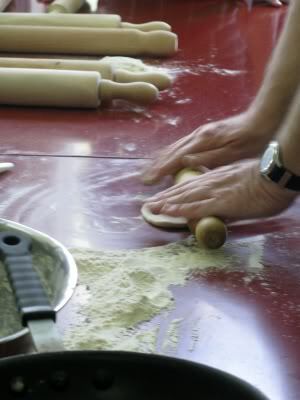 There was plenty of space and dough for us all to have a go. Kurma moved on to some of the other dishes – toor dal soup, lemon rice, matar panir, raita and then halava for dessert. 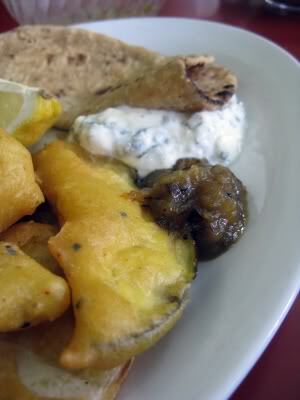 The absolute last thing we cooked was the pakoras, battered chunks of eggplant, cauliflower and potato. While I was keenest to eat the cauliflower ones, to my surprise the eggplant pieces were my favourite. After a 5-hour marathon of chopping, cooking and note-taking, we were all desperate to dig in. It was a feast well worth the effort! The panir came up nicely in its tomato gravy and the lemon rice – dotted with cashews, mustard seeds and herbs – was a lovely change from the steamed rice I usually eat. The pakoras and chutney were a deadly-delicious combination, and the raita was a cooling reprieve. While Michael returned to the mains for more, I focused on dessert. 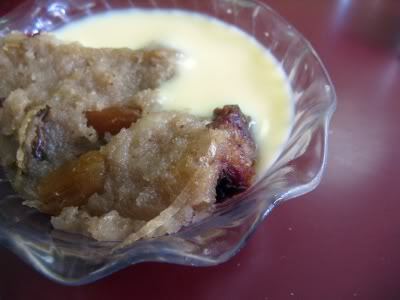 This semolina pudding is great comfort food, though I was surprised at how much ghee went into it! Halava might make it onto our table a few times this winter. 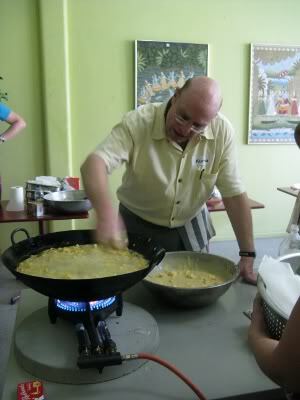 This cooking class was an altogether different experience to the one we attended at LaZaT a couple of weeks earlier. With around 25 students attending over 5-6 hours, Kurma’s class was much larger and longer. With more dishes and more people, the tasks were divided amongst us instead of each of us attempting everything for ourselves. Nevertheless, there was ample opportunity to observe the processes involved and question Kurma. He knows a lot about food and I learned much from him in person that I couldn’t have just by reading his recipes. Kurma used to do (maybe still does?) 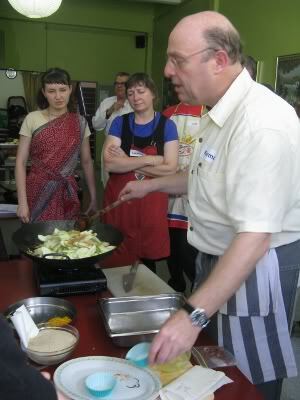 semi-regular classes at Cooking Coordinates in Canberra. I got to go to a few of them while I was working at the Belconnen Markets, and I LOVED it. 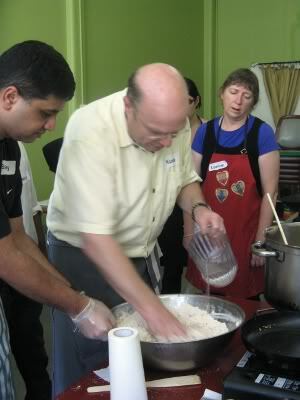 CC classes were a very different style – no hands-on cooking, unfortunately, but they were fabulous. I still cook from ‘Quick Vegetarian Dishes’ all the time! What a great cooking class. I like the selection of different things cooked. The paneer making would be fun. Yum! I love eggplant pakoras, when I used to work at Wholefoods (at Monash) every once in awhile we could convince the chef to make them – so good! So glad you enjoyed the experience and look forward to reading your blog when you cook some of the dishes you did during the class. Great present. I am amazed at the amount of oil/ghee used. And thanks to you, I made my first paneer too! 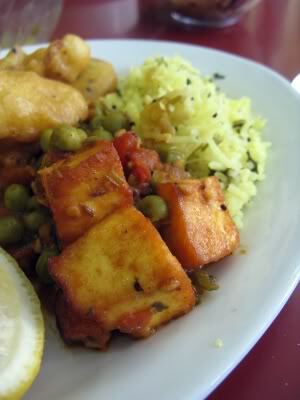 Mark, the paneer is definitely one of the things I’d like to try at home. Penny, I was surprised at how tender the eggplant was, even without any pre-cooking. Delicious! Robyn, it was a lot of fun – thanks again! 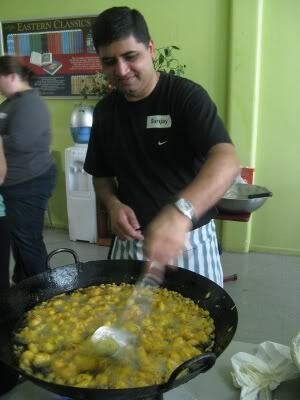 Tytty, Kurma does indeed cook a huge variety of stuff – his World Vegetarian Cookbook has a great mix of recipes. Penny, how’d your paneer go?! I hope we might see it on your blog.